From the much-anticipated sequel to bestselling fantasy novel Taming Fire. 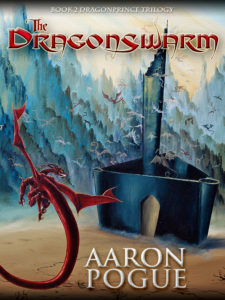 We’re excited to provide a sneak peek at The Dragonswarm, available in digital formats Tuesday, December 20! 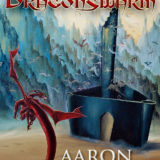 We’d like to thank everyone who contributed to The Dragonswarm‘s successful KickStarter campaign for making this happen. And so we passed an afternoon moving farther and farther from civilization. The farms grew further apart as we went, and smaller and smaller. The river Teel still trickled in and out along the rocky earth, but no crops would grow far from its shore. Farms dotted its shallow banks, but everywhere else was red cracked earth. As we went the horizon grew closer. Ugly, jagged mountains tore at the sky, and even the foothills were hard and sheer. The whole of the continent funneled down to a single point this far south, and the mountains that blocked the coast wedged in on either side of us until our whole vista could not have been more than a dozen miles from left to right. She finally drew rein at a bit of desert much like all the rest, and as I climbed down I couldn’t see why we’d stopped this time. There were trees here–a full pace taller than most of the shrubs we’d passed by–and a bit of a stream, but not much to recommend the place. I took the opportunity to stretch my legs, then finally turned to Isabelle to ask, but she only met my eyes with the spark of excitement in hers. She motioned me to silence and led her horse over to one of the thorny little trees. I followed her example, scanning the ground around me for some indication that we’d arrived, but there was no path and no structure in sight. Still, we tied the horses up, and then she turned without a word and started across the cracked earth. As we walked, a jagged shape on the horizon slowly separated itself in my vision from the black mountain range beyond. It seemed to drift into the foreground, all harsh angles and shadows in the red light of afternoon. Even in the heart of winter, heat hung in the air without a breeze to stir it, and the only sound was the crunching of dirt beneath our boots. And then we topped a small rise, gained a new perspective, and the pieces fell into place. In an instant I recognized the shape of ruins within the jumble–ancient walls of stone that must have stretched for a mile in each direction, and a great crumbled mountain back behind them must have been a tower once. I stared in awe, trying to reconstruct the tower in my imagination. Trying to see how tall it must have been, to leave so much rubble two thousand years later. As we went closer, we discovered it would be more difficult than either of us had expected. The walls were crumbled but still more than three paces high in most places, and their old shape made even the rubble a sheer climb. We found at last where the northern gate had once been, its span long since fallen into a pile we could scale, and beyond that we found the courtyard. Within, the shape of the ruins became clearer. The walls had once made a triangle, its point stabbing toward the southern pass, and at its center had stood the tower. We pressed through thorny scrub and picked our way carefully across treacherous stone, climbing down the far side of the gateway’s rubble and into a lower clearing. In the clearing I saw some signs of humanity–a pit carved out for a campfire, a discarded bit of harness–but even those signs were scant and marked with age. Mostly the place was still, serene, and buried in the black shadow of the ruined tower. Isabelle never took her eyes from it. She stared, and I could see a hunger in her expression. I wanted to stare, too, but I could not forget the warnings her father had given. So I stayed close at her side and picked a careful path for her. I scanned the ground for any sign of a biting snake, listened closely for the soft footfalls of wild dogs. And still I did not see the dragon until it moved. A boulder three paces ahead of us uncurled. It had looked like nothing more than a jagged bit of gray rock, dappled here and there with spots of rust red, but in the space of a breath it stretched out into a dangerous drake. It had a body the size of a large hunting cat, with underdeveloped wings folded tight and tucked close around its ribs. Its short legs sported razor-sharp talons, but I spent far more concern on the spike-tipped tail three paces long and the sinuous neck supporting a head full of cruel teeth. I had no idea if this beast could breathe fire like its larger cousins, but even without that threat it boasted a half dozen different ways of killing a man. I reacted the moment it moved. Old habits threw me into motion while my mind still reeled in surprise. I fell into a fighting stance, turning my body to expose as little of it as possible to my enemy. I took a breath and let it go, and that quickly I was relaxed, poised on the balls of my feet, one arm extended toward the monster, the other stretched out behind me as I pushed Isabelle out of harm’s way. I faintly heard her cry of surprise and pain as she stumbled and fell back, but I could spare no attention for that. Even as I’d fallen into my old dueling stance, I’d played out a new trick as well. I looked on the world with a wizard’s sight, sensing the flow of energies and powers that lay beneath the fragile appearance of reality. There was little to see here. The sun glowed with a distant fire, far too distant to reach, and there was no wind to speak of. I sensed the dance of cold, dark waters in the far depths of an ancient well, but it offered me nothing of value in this fight. I had all that I needed in the earth, though. The earth here–the old worked stones, the hard-packed ground beneath the shadow of the tower–it thrummed with untapped power. I wore no sword on my belt, but with a thought I reached out to the ground beneath my hand and summoned forth a weapon. The raw energy of earth poured up in grains too small to see, a vaporous cloud of black particles that coalesced around my hand, forming into a hilt tailored to my grip. Above that I formed a cross piece–its design stolen from a masterwork weapon I’d once won off a king’s tracker–and then a blade stabbed out from nothing, a pace long and with an edge sharper than any blacksmith could have made. I built the blade in the time it took to think of it, and before it was fully formed I sprang forward to meet the deadly drake. But the beast moved fast as lightning, slithering aside and snapping its long neck away from my vicious strike. Before I could adjust, a voice exploded in my mind. Aha! It is you, it said. I have found you at last! The voice rang with a vicious malevolence that nearly drove me to my knees. Nearly. I stumbled, but a cold black strength deep in the back of my mind rose up against the intrusion. I drew on that strength and forced the echoes of the dragon’s voice away. I hesitated only long enough to reach out with my mind, to gather great handfuls of the rocky earth in my mental grasp, and then I sprang at the drake with another lunge. Once again it tried to dance aside, but this time I threw the earth up against it. A wall of stone sprang up from nothing, not a pace long but shoulder-high on the drake and close enough to trip it up. I sensed surprise and the beginnings of an exclamation in the back of my mind, but I dove forward in a perfect lunge and buried my blade in the drake’s side. I left it there. I darted back before the snapping neck could catch me with its vicious fangs. I dodged a wild lash of the deadly tail. Then I extended my hand and my will once more, and the ebon sword melted from the dragon’s side and flowed into my hand. Blood and ichor gushed from the wound it left, and three heartbeats later the little drake fell still. I used my wizard’s sight to search the courtyard for the telltale empty stain of a dragon’s power among the vibrant energies. I turned in both directions, but I saw no other shadows than the dead beast at my feet. I let the vision fade and stood panting for a moment, staring at the thing. Then I stepped to its side, pressed its neck beneath the heel of my boot, and removed its head with one swing. Isabelle made a tiny sound like a whimper. I am so excited! I love this series! Keep at it Mr Pogue!